This post is quite a fun one. Whilst I was working with a customer today someone came up to me and asked if it was possible to add tabs to their content pages to which I gave it a few seconds thought and I responded “sure that’s absolutely possible – leave it with me!”. I then spent my commute home thinking about how tabs could be delivered for end-users to make use of without them having to meddle around with any code. 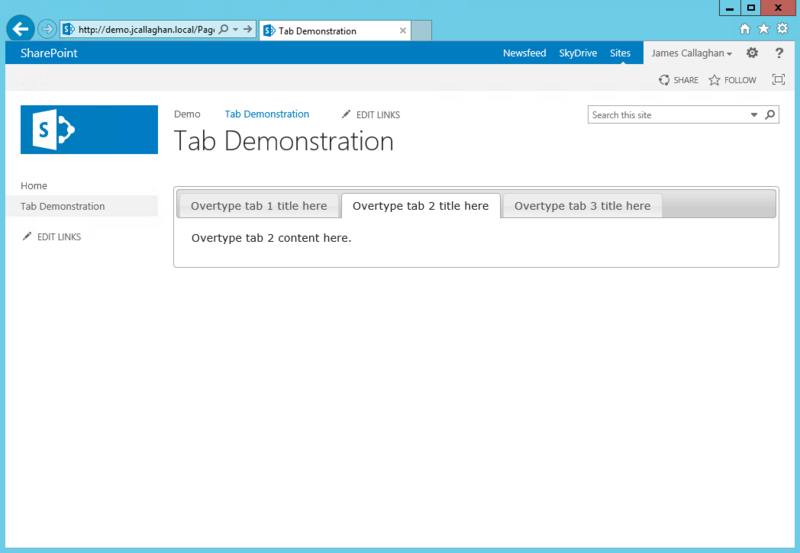 Sure getting tabs to work in SharePoint is pretty straight forward and is something we’ve all done at least on a couple of occasions but I give more thought about making it easier for the end-users to consume rather than just meeting the customers requirement by putting in a solution that isn’t pretty nor easy to use. 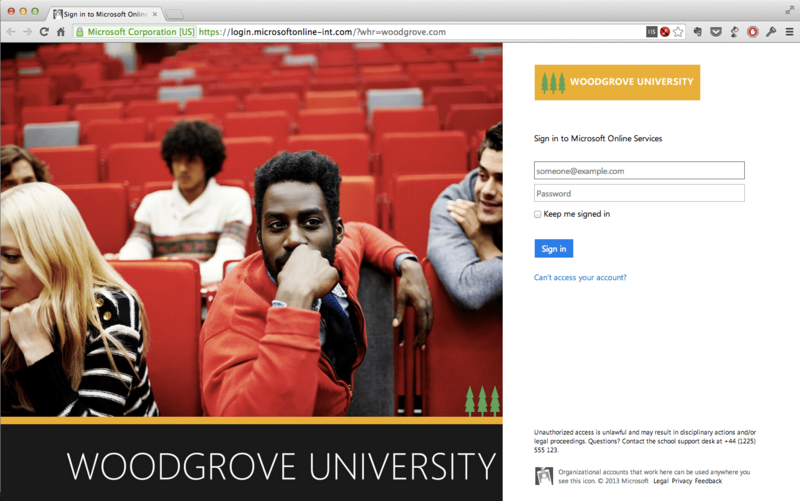 I eventually decided to use, what I thought was a very simple approach to giving users the option to use tabs. My solution makes use of the tabs from the jQuery UI (http://jqueryui.com/tabs/) library. It starts with a small modification to the master page that is currently being used. The following code should be added before the closing </head> tag. I then added the following to the “Reusable Content” list in the root site of the Site Collection where I was adding tabs. Make sure that the “Automatic Update” is unchecked for this piece of reusable content. Below is the code that should be added to the Reusable HTML field. 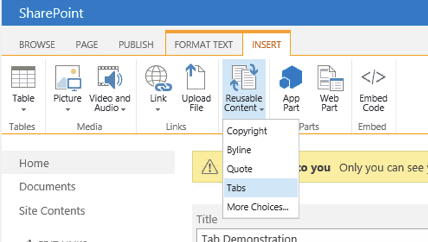 To add the tabs onto a content page you can simply select the item that has just been added to “Reusable Content” list by clicking on the “Insert” tab whilst editing the page and expanding the “Resumable Content” menu. 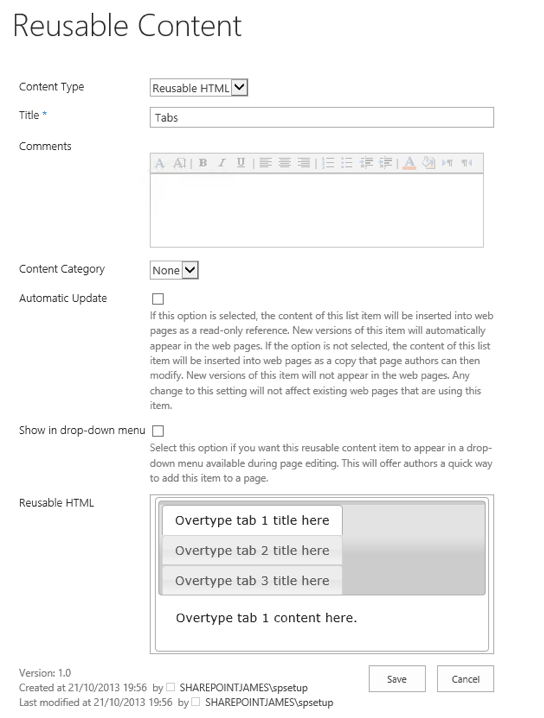 Rich text that represents the HTML markup for the tabs is then added onto the page. Each tab is represented by a bullet list item “<li>” and a content area “<div>”. The names of tabs you require can then be added by carefully overtyping the existing tab names. You must be careful not to introduce or remove any markup as this might prevent the tabs from working correctly. Once you have entered the names of the tabs you can then add the appropriate content by overtyping the content that you wish to include in that tab. 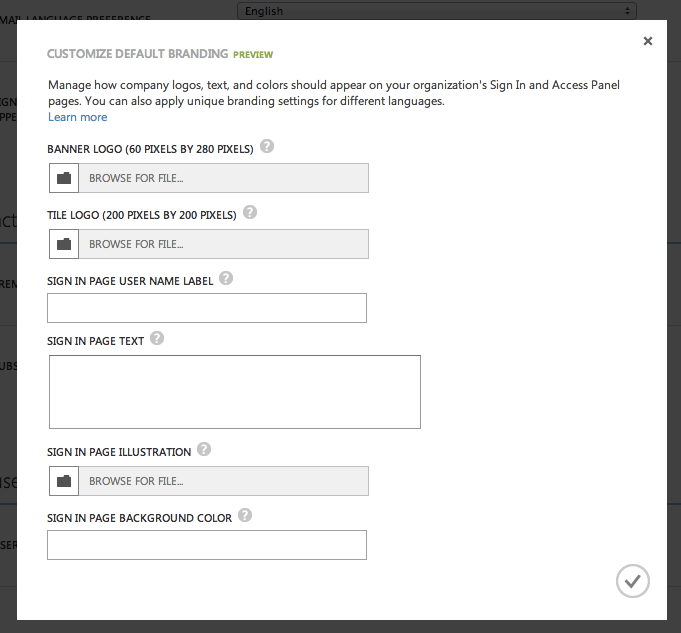 This content can consist of rich text such as tables, images and also web parts. Again you must be careful not to introduce or remove any markup. Any tabs that are no longer required can be carefully removed by deleting the bullet list item and content area. There are other ways to achieve the same result but I thought this was a simple approach using out-of-the-box functionality. Happy tabbing! 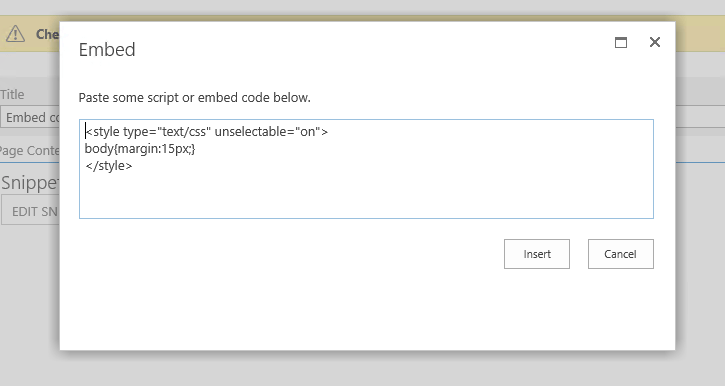 Previously we did this by editing the page source or by creating lots of text files and linked them using the “Content Link” parameter in “Content Editor Web Parts (CEWP’s)”. 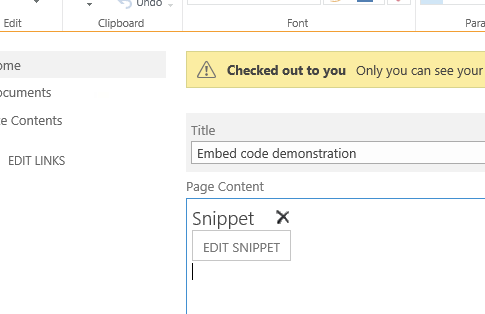 Now we can easily embed code on a content page where SharePoint places it is in a lovely dedicated snippet section that is only visible when you edit the page.